It’s nice to get away from the office for a while and just enjoy the park. The expansive view of the coast helps time slow down. You’ve got nowhere to be and you’re not in a rush. As you’re wandering around, gazing up at the trees, you’re not looking where you’re walking. Your foot lands awkwardly on a rock and you go tumbling down without enough time to brace yourself with your hands. As you get up and dust yourself off, your tongue feels a canyon between your front teeth. One of them has been knocked out and you’re bleeding. What do you do in this situation? Dr. Howard, an emergency dentist in San Marcos, talks about what you can do in this type of situation. The number one indicator is pain, and by extension, blood. 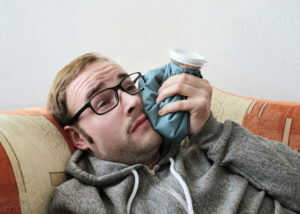 If something has happened to your teeth and you are in an overwhelming amount of pain, don’t try to gut it out. It is best to try and seek out treatment immediately. What Should I Do in the Moment? The first thing to do is to stay calm and make sure you are out of danger, depending on where you are. Many dental emergencies happen in the home, but they can also happen out on the road while driving. It is easy to get caught up in the moment when your teeth are damaged, but making sure your overall safety is taken care of is paramount. Once you are in a stable place, call Dr. Howard’s office at (760)-571-2508. In the case of bleeding or swelling, they can be mitigated by applying pressure, ideally with a cold compress. If you have lost any teeth, please try to gather them as it may be possible to reinstall them later. Should I Go to the Dentist Or the Emergency Room? If the bleeding is overwhelming and you can’t stop it, this is when you should call 911 or head to the hospital. You should also do this if you have experienced any other traumatic injuries, such as broken bones. If the trauma is limited to your teeth, this is when you should head to the dentist office. It is best to have a trusted person drive you, if available, as dental emergencies often coincide with concussions and can leave victims disoriented. Once you are in Dr. Howard’s office, he will assess your situation and determine the best course of treatment, where it be stitches, installing a new crown, or an extraction. You can try to prevent dental emergencies by generally being aware of your surroundings and wearing a protective mouth guard if you play sports. However, life just happens sometimes, and that can lead to a dental emergency. Should you find yourself in that situation, be sure to stay calm and call Dr. Howard so he can start helping you immediately.